A marriage of style and functionality. 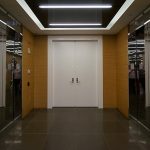 Total Door Cross-Corridor & Area Separation Systems are safe and secure and paired with aesthetic appeal, to create a truly efficient space solution. This streamlined integrated door systems facilitates movement in high-traffic zones or demanding environments. Custom engineered and designed to blend into its natural surroundings. Attractive, safe, secure. Total Door Cross-Corridor & Area Separation Systems offer the best security of any product on the market. With a full-height locking channel, this door acts like a 5/8” deadbolt along the full length of the door. This eliminates the need for floor hardware, vertical rods, astragals, coordinators, and flush bolts on pairs and double-egress fire doors. In addition, Total Door systems have the lowest smoke migration rating of any competitor, which is accomplished without the need for intumescent seals. Designed to blend in naturally with any décor. With concealed hinges, flush panic devices, and closers – this Cross-Corridor Area Separation System is as hidden as it is functional.